NORMALHEAVY Timer 2:30:00. See T-Doll Production for details. The Thompson submachine gun is an American submachine gun that became infamous during the Prohibition era. It was a common sight of the time, being used overwhelmingly by both law enforcement officers and criminals. The Thompson was also known as the "Tommy Gun", "Chopper", "Chicago Organ Grinder", "Trench Broom", "Trench Sweeper", "Chicago Typewriter" and "Chicago Piano". The Thompson was favored by soldiers and civilians alike for its compactness, ergonomics, large .45 ACP bullet, and high volume of automatic fire. Her attire was based on 20's gangster style. 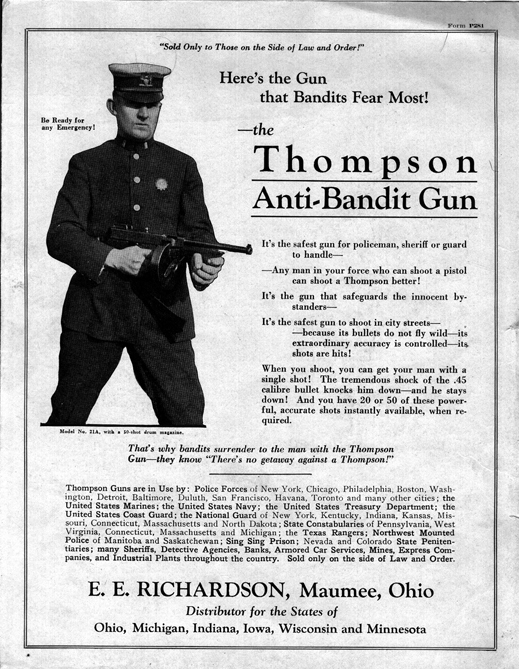 During Prohibition Era, Thompson Sub-Machinegun was intended for law enforcer and police use, based on old poster of Thompson which claimed as 'Anti-Bandit Gun' and 'Sold only to those on side of law and order' and ironically was used by organised criminals and gangsters. Despite the Thompson's association with outlaws and gangsters in Prohibition Era, not all criminals could afford the M1928; it cost $200 with a single 20-round magazine, thus extremely overpriced for average thug. Thompson once modified to be loaded with .30 carbine cartridge, which is standard ammunition for M1 Carbine and its derivative. Compared with M1 carbine, Thompson Light Rifle could fire the .30 carbine full-automatically where the M1 Carbine could only fire semi-automatically(M2 Carbine later introduced at early 1945). Thus making the characteristic is as same as AR StG44 does, which however never entered into service despite it passed the test and worked well due the expensive to be mass produced. So far, Thompson is ONLY the 5* SMG that can be obtained by insert a base amount of resources(30 points). While Thompson was overshadowed by low evasion rate for 5* t-dolls, she's very useful to be put in frontline thanks for the biggest HP value among SMGs and active skills. The gun portrayed in the game is the 1927A1 semi-automatic carbine produced by Kahr. It has an 18" barrel as opposed to the original Thompson submachine gun's 10" barrel. SMG Thompson, SMG G36C and SMG MP5, although their skills say they give them a shield with 9999 points of HP, they in fact actually dont, instead their shields give them a "Defence" value of 9999 points instead, which negates 100% of incoming damage as long as they're at their max Defence Value, the only way for an enemy to punch through their shields is if they possess a "Defence Piercing" Stat as well as a "Shelling Damage" stat. which only 1 enemy currently has.